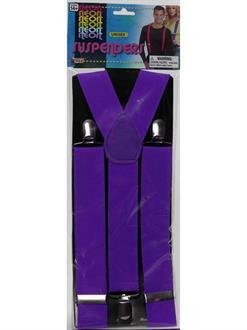 If your Halloween costume needs one last thing to be perfect, try the Purple Suspenders For Adults! Add an extra pop of color to your clown costume, be a far-out and fashionable disco dude, or hike your pants up to your chest as a nerd or old man. These polyester suspenders are also great for adding extra oomph to your Mardi Gras ensemble.